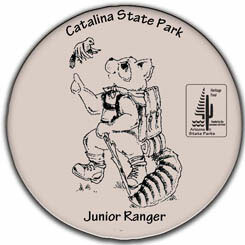 If you're between ages 6–12, you can become a Junior Ranger at Catalina State Park! Pledge to do your part to help preserve the beauty of the park for everyone to enjoy! It's a Saguaro's Life: Only in the Sonoran Desert can you find the Giant Saguaro Cactus! It takes a l-o-n-g time for a Saguaro to grow to full size. Help this Saguaro grow from a seed to adult by matching the description of the Saguaro’s life with the drawing that shows what is described! Place the correct number in the boxes.